Sherry is a Gifted Intuitive Medium. Using her talents of clairaudience, clairvoyance & light channeling, Sherry is able to see and speak with your guides and receive the answers and information you are seeking. She brings forth answers and information from your Spirit Guides and Angels to direct you on your life’s path and your soul’s journey. Her intention is “to empower you to work with your Spirit Guides and Angels, finding the solution to your individual situations using the Universal Laws of Creator.” She has studied with spiritualist mediums, psychics and healers from the USA, Canada, U.K. and Australia. Ethel channels information about purpose, life path, health issues, future and past lives. Featured on Television & Radio shows throughout the Eastern US, Ethel is an outstanding intuitive. 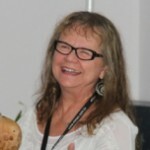 In 1975, she began an intensive study in Parapsychology, Metaphysics & Intuition for the Poseidia Institute at Virginia Beach, VA. She has provided her services to major corporations and government agencies, including the Wash. D.C. Homicide Div & Missing Persons. Ethel is the author of Journey Past Human Limitations through a Visionary’s eyes . . . Make Your Way to the Wonders of the Blue Crystal Planet. 12 – 6 pm — 45 minute sessions for $65, cash. Call (828) 687-1193 for an appointment with Ethel.